Halve the tomatoes and place on a non-stick baking sheet, cut side up. Drizzle over the olive oil and Balsamic and season with the sugar (if using). Roast for 20-25 minutes until the skins are blistered then top the 4 bottom halves with the mozzarella and roast for another 5 minutes. Remove from the oven and place a basil leaf on each bottom half then close with the top half. To make the dressing, blitz all the ingredients in a small food processor until the basil is finely chopped. 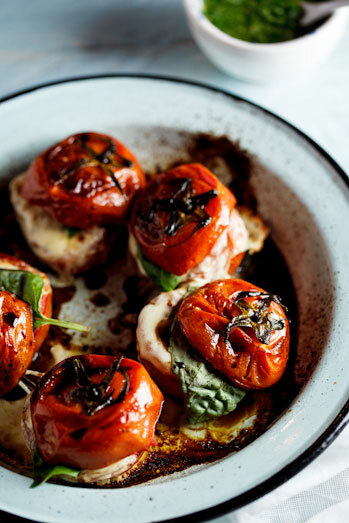 Serve the tomatoes on a bed of wild rocket, drizzled with the dressing.